Welfare services in the local authorities are budgeted according to the “matching” method: for every shekel invested by the local authority, the Ministry of Labor and Welfare allocates three shekels. Thus, in practice, 75% of the welfare budget is financed by the Ministry of Labor and Welfare and 25% by the local authority. Israel’s Supreme Court is currently examining a petition against this funding method that claims it is unequitable. The chapter examines budgetary patterns and indicates that there is indeed considerable inequality in budgeting between strong and weak local authorities, but most of this gap is explained by differences in expenditure on out-of-home care frameworks, which are particularly expensive. The gaps seem to be related to the resource constraints of the weaker communities, the absence of out-of-home care frameworks tailored to the Arab Israeli population, and localities’ preferences for addressing their residents’ needs. The primary responsibility for the welfare of individuals, families and communities rests with local authorities, yet the allocation of resources is not uniform across all localities. The average welfare expenditure stands at 11% of the total budget in localities of low socioeconomic ranking, and at 6% among those with a high socioeconomic ranking. 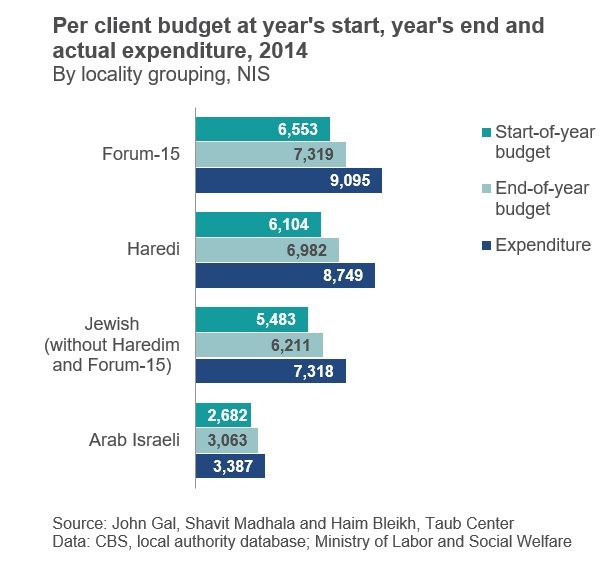 The average expenditure on welfare (including the allocation from the Ministry of Labor and Welfare at the end of the year and self-generated supplements allocated by the localities) in strong localities without balanced-budget grants and government development grants (Forum-15 localities) is NIS 9,095 per client, while in Arab Israeli localities the expenditure is only NIS 3,387 per client. In the Haredi localities, which are categorized as part of the low socioeconomic cluster, the average expenditure is NIS 8,749, compared to NIS 7,318 in the remaining Jewish localities. Thus, there is considerable inequality between various local authorities, and those who require assistance the most and live in localities of low socioeconomic status are the ones to which the fewest resources are allocated. The vast majority of authorities (92%) utilize the entire budget earmarked for them at the beginning of the year, and even spent more than the required sum. Of the 20 localities that do not utilize the budget allocated to them, only eight are ranked in a low socioeconomic cluster (all are Arab Israeli localities), while the other 12 authorities are ranked among the high socioeconomic cluster. Though most authorities did manage to meet the funding level, it is quite possible that authorities with fewer resources request a relatively small sum from the national government in order to avoid a situation where they cannot meet their share of the funding later in the year. The researchers find that about 64% of the explained variance in the initial funding that localities receive from the Ministry of Labor and Welfare can be explained by differences in the types of care frameworks localities use to provide social services. A gap that disadvantages the weaker authorities emerges already with the initial allocation by the Ministry of Labor and Welfare: NIS 3,170 is allocated to the localities of low socioeconomic standing, on average, as opposed to NIS 5,400 to the other authorities. Gaps in the average allocation earmarked by the Ministry are also prominent when examining localities by their demographic composition: NIS 2,682 in Arab Israeli localities, NIS 5,483 in Jewish localities, and even higher sums in Haredi and Forum-15 localities. Most of the gap between localities in per-client budget allocation can be explained by types of care frameworks: the weaker authorities use fewer out-of-home frameworks, which are the most expensive. Wealthy localities tend to allocate many more resources to welfare issues, beyond those required to receive funding from the Ministry of Labor and Welfare through the matching method: the rate of self-generated income out of total welfare expenditure is 30% on average in Arab Israeli localities, 36% on average among the Forum-15, and 37% on average among Haredi localities (though they belong to lower socioeconomic clusters). These supplements mean that in overall per-client expenditure for welfare services, there are even greater gaps than were seen in the original budgetary allocation by the Ministry of Labor and Welfare.